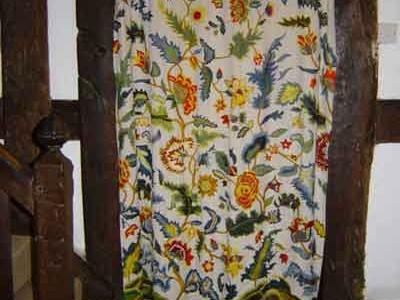 The project leader is Pauline Mountain, she explains how the long curtain took six years to finish, starting with eight people around the big frame but falling to five due to three of the older members dying. The original design is in the V & A and is shown on the cover of one of their books on design. 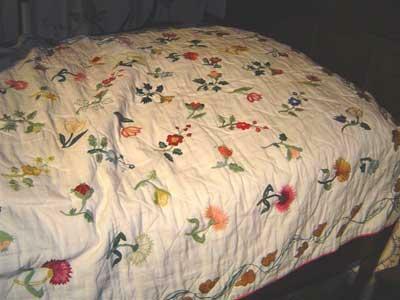 This beautiful bed cover took five of the embroiders four years to make and one year to quilt, as none of them had ever done quilting before so they had to first learn a new skill. 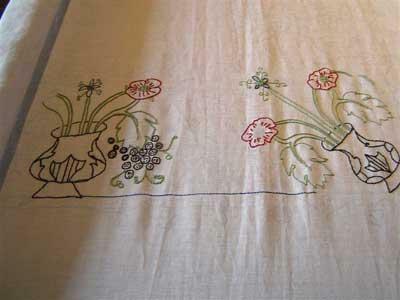 The sewing below is still on the frame, this work in progress is also going to be a bed cover. However in this case nearly all of it in backstitch with a few french knots. The colours and designs for the projects are carefully researched. All the projects are financed by the Friends of Ford Green Hall who are very keen for the Threaders to continue to pass on their skills. The Ford Green Threaders are now down to four people, however Pauline recently did some teaching for the museum because a lot of people say that they would like to be able to do such beautiful work, but can't even thread a needle! They also do occasional classes for visiting school children because embroidery is not taught in schools anymore!